The Bay Area is changing. We are living in an age of climate change, housing shortages, rapid job growth, income inequality, aging infrastructure, fiscal stress and — soon — driverless cars, trucks and buses. Many of our local governments are working to transform their communities into places that are walkable and connected by transit. Transportation agencies are struggling to balance demands to serve transit-dependent populations while providing new service to growing neighborhoods. And all levels of governments are scrambling to find the funding needed to upgrade infrastructure, invest in affordable housing and carry out their responsibilities. But local governments and transit agencies cannot take on these significant challenges on their own. We need effective — even visionary — regional government to put its resources and staff toward solving them. Fortunately, we are in the midst of the biggest change in regional governance in years: Two Bay Area government agencies — the Metropolitan Transportation Commission (MTC) and the Association of Bay Area Governments (ABAG) — voted this past June to consolidate their staffs and begin to integrate work programs in order to fully merge ABAG’s staff into MTC by January of 2017. SPUR has long called for this merger and supports the concept of fully integrating ABAG and MTC (including eventually restructuring the two agency’s governing boards). Once complete, the newly merged agency will have more than 300 staff members, including a unified planning department of nearly 50 people. We see this merger as a major opportunity — not just rearranging the desks and reporting structures inside the new Bay Area Metro Center in San Francisco. It is, more importantly, a chance to design the type of regional government and planning structure we need to solve the region’s shared problems. There are four critical actions for the new agency to take on during this merger process. These ideas are based on SPUR’s understanding of the needs of cities, counties, transit operators and countywide congestion management agencies, as well as our observations of the strengths and weaknesses of MTC and ABAG. Implementing each action is critical to the ultimate success of the merger and should be done in collaboration and dialogue with staff and external partners across the Bay Area. 1. Establish a clear mission for the merged regional agency. Form follows function, and mission determines function. Establishing a clear mission for the merged entity is essential to identifying how it should be structured. MTC (and one of its other hats, the Bay Area Toll Authority,) has operated for decades without a defined mission. Instead MTC/BATA has organized much of its work around statutory responsibilities and funding programs, such as producing a Regional Transportation Plan based on county transportation plans, managing the bridge seismic program and operations, running Clipper and 511, and administering state and federal transportation program funds. Appropriately, most of MTC’s work has revolved in and around transportation. ABAG has a broad mission that includes helping local governments “meet their planning and research needs related to land use, environmental and water resource protection, disaster resilience, energy efficiency and hazardous waste mitigation, and to provide risk management, financial services and staff training to local counties, cities and towns.” However, ABAG has no funding or authority to help cities and counties make tangible progress on most of these fronts. The combined agency needs to assess the organizations’ current strengths and then identify the priorities and activities for regional planning. It is incumbent to answer how regional government can support planning across transportation, land use, housing, economic development, resilience (including climate change and disaster preparedness) and more. We encourage MTC and ABAG to go through an exercise of identifying these priorities before consolidating their staffs. Once there is clarity on the new agency’s priorities and scope of the work, it should be reasonably straightforward to craft a new mission statement. For example, the mission statement for the well-regarded Puget Sound Regional Council (in Seattle) is “to ensure a thriving central Puget Sound now and into the future through planning for regional transportation, growth management and economic development.” In Seattle’s case its transportation work and its land use and economic development programs are complimentary with each other. In the Bay Area, we must ensure that land use planning in the merged agency is not subsumed under transportation. 2. Develop new ways of working with local governments, particularly cities and counties. Historically, regional planning in California has required a careful balancing act that respects the sanctity of local control and uses leverage like financial incentives to advance regional goals. But the issues facing local governments are changing and increasing in complexity. They require a new approach to regional governance and new roles for regional agencies. The region’s 100-plus local governments and the communities they represent are diverse. Collectively they are working on issues ranging from rewriting zoning to preserve industrial lands to expanding tenant protection policies to producing new transit station area plans and more. There is also a shift toward planning for many different modes of travel in cities where walking, transit and other non-car modes truly thrive. Urgent local issues include bringing an end to traffic deaths, allocating curb space for transportation network companies (like Uber and Lyft) and setting up mobile payments for city services like parking. Responding to these issues is costly and time-consuming. And having each community try to solve them independently works against cohesiveness across the Bay Area. This can result in ineffective policies and projects, as well as overspending for too little benefit. Staying in synch will only get more difficult for local governments with the greater proliferation of services that cross city boundaries (like bikesharing, parking, shuttle services and new transit like SMART rail). Addressing these local challenges also requires specialized knowledge that does not exist in all local governments and agencies. But such expertise does, or could, exist at the regional agencies. As a solution, the merged agency could develop teams focused on specialties, such as managing and implementing specific plans and zoning changes — or promoting multi-modal mobility and upgrading local transportation infrastructure. The new agency could, upon request, deploy these teams to work inside local governments or small transit agencies several days a week, similar to what Chicago’s Metropolitan Agency for Planning currently does in its Local Technical Assistance program. A framework to provide this level of support already exists through the Priority Development Area planning grants program. A consolidated staff should also be better able to align regional investments to directly support Plan Bay Area and its project and program evaluation, particularly around issues like promoting seamless transit, improving the Clipper fare payment system and increasing automobile occupancy rates. A more forceful role for regional government would be to require all local governments in the region to ensure that their local zoning is consistent with the regional plan. This role might even extend to preventing localities from having certain types of laws (those limiting secondary housing units, for example). Increasingly, the Bay Area has been setting conditions for some of its regional funds based on whether local communities have adopted a particular set of policies (such as complete streets, surplus land or tenant protection measures). This approach is primarily a way to use funding as an incentive to encourage communities to take steps toward important regional goals like producing affordable housing. The merged agency should continue to set conditions for some of its funding and expand the use of such financial incentives. Moving forward, we need to determine the best roles for both local and regional governments. The staff of the merged agency should reach out directly to local governments, transit operators and other “customers” to help design programs and services to be most effective. These conversations should begin this fall, before the staff consolidation. 3. Take on regional housing policy in a big way. The rising cost of housing is one of the top issues facing the Bay Area and has long been an area of work and concern for both MTC and ABAG. ABAG is responsible for the somewhat contentious process of allocating housing production goals to cities every eight years through its Regional Housing Needs Allocation (RHNA) process. 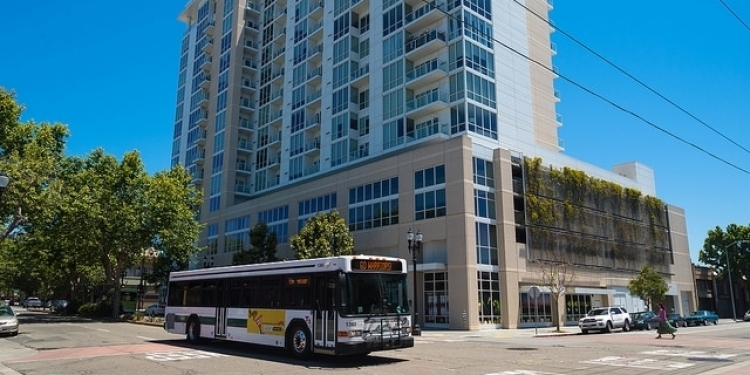 MTC has gone further than most other metropolitan planning organizations in using some of its discretionary transportation funds for investments in housing, such as through the creation of a $50 million Transit Oriented Affordable Housing fund, which started with a $10 million investment from MTC, and MTC’s recent $10 million investment in the Naturally Occurring Affordable Housing fund. With a consolidated staff, there is an opportunity to do more. As discussed above, staff members could provide more direct support to local governments to meet regional goals. The region could also target some investment in local infrastructure (i.e. streets and sewers) in places where it would make development more feasible. Our regional agencies could also set conditions for an increasing share of funds based on local housing production and other policies. Already, cities receive some infrastructure funds from MTC and county congestion management agencies based on how much of their RHNA housing goal they build, and at what affordability levels. And a plan is underway to disburse these funds with scoring criteria that includes whether a city has adopted policies to protect tenants or promote affordable housing. Over time, the merged agency should increase the percentage of funding that such conditions and criteria apply to. But could we go further? For example, the subsidy required to meet the region’s low- and moderate-income housing needs is about $1.1 billion a year. Could the regional agency build support for a strategy to raise a portion of this funding by expanding the sales tax ceiling, creating a fee on office development that funds affordable housing (called a “jobs/housing linkage fee”) or other measures similar to those proposed at the April 2016 MTC Commission workshop in San Jose? The Bay Area has already demonstrated support for raising revenue regionally for broad goals, such as the 2004 one-dollar bridge toll increase that funds transit operations and expansions and the June 2016 Bay Restoration parcel tax increase. Ultimately, taking on housing at the regional level requires an acknowledgement that our current approach is failing, that more money must be invested in affordable housing, that more housing for all incomes must be built near jobs, that transportation investments must truly be coordinated with growth, and that many local governments must be more willing to allow new housing. 4. Take a leadership role in regionally significant areas or projects. A fourth role for the merged agency is to provide leadership on major transit hubs or redevelopment projects that will have significant impact on the whole region, such as Diridon Station, the Transbay Transit Center, downtown Oakland, Alameda Point, Concord Naval Weapons Station, North Bayshore in Mountain View and Millbrae Station. For the Bay Area to meet its planning objectives, these places of regional significance need both coordination and alignment across many transportation providers and local policy makers. If a city approves a low-density development across the street from one of the Bay Area’s most important transportation hubs, this will undermine bigger goals for the region. If a transit operator sites a new transit station at a location that doesn’t connect well with the rest of the transportation system, the entire region loses out. Regional government should be in the role of setting forth a vision and then convening and coordinating local governments and transportation agencies to achieve it. Another role for regional government could be to assign teams to focus on key transportation corridors. For example, the Transbay Corridor has the greatest number of transit riders and the most crowding, which is undermining reliability for the broader regional transit system. Resolving this problem will take much more than implementing individual projects. On the Caltrain Corridor, both crowding and the need to switch to electric-powered trains present pressing problems. Should there be dedicated teams at the regional agency focused on implementing long-term solutions for these and other corridors? In the coming months, we expect MTC and ABAG to begin discussing these issues. Specifically, we encourage staff to set a goal to identify key priorities that will result in greater clarity on an overall mission for the merged agency by October. Doing so will require reaching out to local government and transportation partners, as well as other civic groups. By the end of the year, staff should identify potential teams to accomplish the new priorities. We recognize that there are many other important goals for regional planning that we have not discussed in depth, such as economic development and climate change. For now, we believe the most critical immediate tasks to start with are those outlined above. The agency’s other core priorities can progress once this groundwork is set. Ultimately, the creation of this new regional agency offers a once-in-a-generation opportunity to come up with solutions that match the scale of our problems. We remain hopeful that the merger of ABAG and MTC will set us on this path.